Home Medical Entrance Exams NEET NEET Eligibility Criteria 2020- Are You Eligible? Check No. of Attempts etc. NEET Eligibility Criteria 2020- Are You Eligible? Check No. of Attempts etc. Are you preparing for NEET 2020? Planning to Fill in the Application Form? Want to know the NEET Eligibility Criteria 2020? So, if you are one of then you have landed to the right page. The National Testing Agency has determined the NEET 2020 Eligibility Criteria for the candidates. For getting admissions through NEET 2020, candidates must satisfy the eligibility criteria. The Exam is expected to be conducted in Feb 2020 and is conducted to offer the opportunity to the candidates who wish to take admissions in MBBS/BDS Courses from MCI/DCI approved colleges. Intermediate Graduates (10+2) with a minimum of 50% marks are eligible to apply for the Examination. The Official Website of NEET is – www.nta.ac.in. Hence, In this article, we have provided details about NEET Eligibility, Age limit, qualification marks etc. The National Testing Agency has not announced the official dates yet. The dates mentioned above are the tentative dates. The Nationality of the Candidate must be Indian/NRI/OCI/ PIOs and Foreign Nationals. The Candidates must be 17 years of age as on 31st December 2020 and must not be more than 25 years of age as on 7th May 2020. Hence, the upper age limit is 25 years. An Age Relaxation of 5 years will be applicable for the candidates who belong to the reserved category. Candidates must have passed 10+2 or equivalent with Physics, Chemistry, Biology/Biotechnology and English as core subjects. Candidates must have passed Class 11th and 12th from a recognized board. The Applicants must have passed with a minimum of 50% marks for UR Category, 45% for UR PWD, and 40% for Reserved Category. There is no limit on the permitted number of attempts. The NEET Scores for the candidates who are willing to study in abroad is valid for 3 years. Candidates who will be taking Class 12th Board Exam in 2020 and their results are awaited must submit this code. 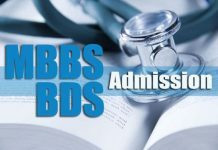 Qualifying the Exam is mandatory for the candidates who are willing to take admissions in MBBS/BDS Courses. This code is applicable to those candidates who have passed Class 12th Board in 2019 or before and have not pursued in any other course after the completion of Class 12th Board Exams. Candidates who have completed the Intermediate/Pre-Degree Examination in Science and of Indian University/Board with Physics/Chemistry/Biology/Biotechnology and English as the compulsory subject. The course should include the practical test in science subjects. Candidates whose qualifying examination is equivalent to Class 12th completed from the State Board. The Pre-Professional/Pre-MedicalExaminationExamination after passing either Higher Secondary Examination or the Pre-University or an Equivalent Examination with Physics/Chemistry/Biology/Biotechnology and English. The Pre-Professional/Pre-Medical Examination include practical tests in these subjects and also English as the compulsory subject. Candidates who are pursuing a three-degree course of a recognized University must qualify the first year with Physics, Chemistry, and Biology/Bio-Technology including the practical tests in these subjects. Candidates should pass the earlier qualifying examination with Physics, Chemistry, Biology/Bio-Technology with English at a level not less than a core course. Candidates who have qualified the B.Sc Examination from an Indian University with not less than two of the subjects Physics, Chemistry, Biology (Botany/Zoology) and further he/she has passed the qualifying examination with Physics, Chemistry, English and Biology. Any other examination which is equivalent to the Intermediate Science Examination of Indian University/Board taking Physics, Chemistry, Biology/Bio-Technology including the practical tests. Candidates who have qualified the examination from a University located in Foreign Country are required to fill in this code. The equivalency of the course in Class 12th is determined by the Association of Indian Universities (AIU). If the marks are obtained in the qualifying examination are in grades then the equivalent marks will be determined by AIU. According to NEET 2020, the candidate has to complete 17 years of age as on 31st December 2020. The NTA Age Limit of the candidate must not be more than 25 years. The NEET Age Limit 2020 for the Reserved Category and PWD Candidates should not be more than 30 years. The Upper Age Limit Norm of NEET 2020 was earlier challenged in the Supreme Court but it did not end up with any decision. Later, the CBSE reintroduced the upper age limit criteria of 25 years of age for Unreserved Category candidates and 30 years for Reserved Candidates. This decision was temporarily removed by Delhi High Court’s Verdict on 26th April 2018. As a result, candidates belonging to the unreserved category with more than 25 years of age were allowed to take the test. The decision was upheld by the court in the judgment in May 11th, 2018 and the result of these candidates was not issued. To fulfill the NEET Eligibility Criteria 2020, candidates must have passed Physics, Chemistry, Biology/Bio-Technology, and English individually in the qualifying examination. Candidates belonging to the Unreserved Category must score a minimum required percentage of 50% makes in Physics, Chemistry, and Biology/Bio-Technology each. Reserved Category candidates (SC/ST/OBC) must score a minimum of 40% of marks in each of the following subjects – Physics, Chemistry, Biology/Biotechnology in their Class 12th or HSC Examination. The General Physically Handicapped Candidates have to score a minimum of 45% marks in each subject – Physics/ Chemistry/Biology/ Biotechnology. In order to appear NEET 2020, candidates have to pass Class 12th and or equivalent examination with Physics, Chemistry, Biology, and English. Candidates who have passed their Class 12th from outside the country must also fulfill the eligibility criteria of NEET 2020. The last examination passed by the candidate must be equivalent to Class 12th from other countries. Candidates should have physics, chemistry, and biology including the practical test in each of these subjects and English should be a compulsory subject in the qualifying examination. The number of attempts was removed for NEET 2018 and same for NEET 2019 as well. Candidates can appear NEET Exam as many times based on their NEET Age Limit. Applicants can appear NEET 2020 twice in a year for the first time. Only one attempt is allowed in a session. Candidates who qualify NEET 2020 are eligible for 15% All India Quota Seats. The J & K Candidates are not eligible for 15% All India Quota Seats except for those candidates who have filled a self-declaration form. It must be noted that the candidates who are submitting the self-declaration form cannot participate in the Home State Seats. These candidates will be eligible for Deemed Universities/Central Universities/ESIC and AFMC Colleges. The 80% of the DU Seats and Institutional Quota Seats of AMU will be available for the candidates who have completed their Class 10th and 12th from Delhi/AMU University respectively. The State Quota Seats implies the Government Colleges/Universities of the States/Territories. 85% of the seats are reserved under State Quota Seats. The counseling of such seats will be conducted by the authorities of that particular state. To be eligible for this criteria, the candidate has to satisfy the eligibility criteria as per condition laid by each conducting authority of the State/Union Territory. One of the major common criteria under the State Quota Seats is that the candidate has to prove their domicile. The admission to the private colleges will also be a subject to the policies of the State/Union Territory. 27% seats in Central Educational Institutions are reserved for the OBC Category as per the Central Educational Institutions. Candidates with a gap year are also eligible for NEET 2019. NIOS Candidates are also eligible for NEET 2020, as the clause which barred such students was removed by the Delhi High Court. As per NTA, candidates having Biology as their additional subject are also eligible for NEET 2020. The NEET NTA 2020 Eligibility Criteria is very important for the candidates who are appearing NEET 2020. Candidates must satisfy the eligibility criteria, otherwise, they will not be eligible for the admission process.